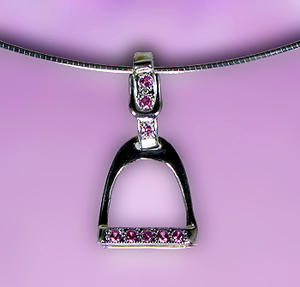 "English Stirrup in Sterling Silver set with Pink Cubic Zirconia"
English riding your game? English Stirrup nicely done in sterling silver set with pink cz's! The Gorgeous Horse your number one source for english and hunt jewelry! Another fabulous design brought to you by The Gorgeous Horse! Check out this economical English Stirrup set with 8 pink cubic zerconias in sterling silver and then rhodium plated to create everlasting luster! Have this piece priced and set with the any color gemstone you would like! Just simply request it on our comments box below! NECKLACE NOT INCLUDED!